Indian Skipper M.S.Dhoni leads his team off the field after their 153-run victory. After two months of being a winless side, the Indian Team finally has something to smile about. Even though the win was against an Associate country (Afghanistan),this victory gave every fan immense happiness. It was a day dominated by the R’s and there have been a handful of positives emerging from this game. Opener Rohit Sharma smashed 150 in India’s 153-run romp against Afghanistan in their final warm-up match on Tuesday. 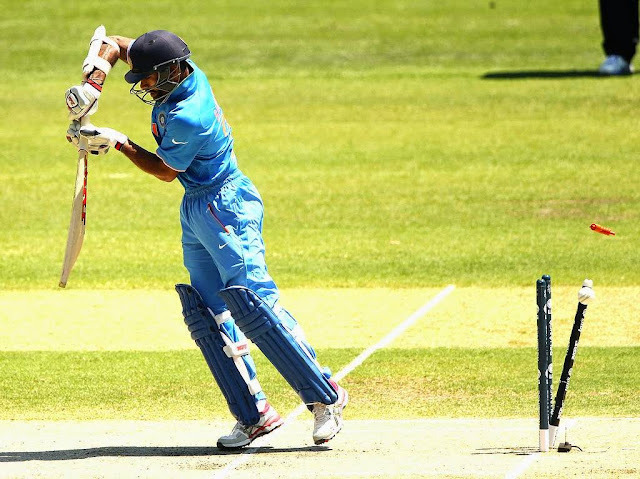 Sharma aided by Rahane (88 not out) and Raina(75) made merry against the opponents with limited bowling sources to drive India to 364-5 at Adelaide Oval. Suresh Raina produces an outstanding 75-run knock. The Men In Blue lost a couple of wickets before the R duo (Rohit and Raina) added 158 in the next 25 overs. Dhawan’s dismissal was primarily due to lack of footwork and Kohli perished trying to edge a delivery. Skipper M.S.Dhoni failed to contribute as he threw his wicket away with an unexperienced shot. Sharma, the only cricketer to have hit two 200 plus scores in ODIs, appeared to be fully recovered as he smashed 12 boundaries and 7 sixes in his 122 ball knock. The two Afghan stars Ghani (44) and Mangal (60), overpowered the Indian Bowlers at some stage. The bowling and fielding was satisfactory and once again we were unable to take timely wickets which could have assisted the Indians to win with a greater margin, rather than having the Afghans rule them for a bit. Nonetheless a win by 153-runs gives the Men in Blue some relief at the end. Now Defending Champions begin their expedition against Arch-Rivals Pakistan on Sunday at the Adelaide Oval. Shikhar Dhawan's lack in form a major worry for the Indians. A win after two months of disheartening performance by the Blue Caps finally gave their well wishers some reason to Beam. The Indian fans were relieved to see the return in form of Raina, wonderful knock by Rohit and Rahane’s back-to-back fifties. The 153 run victory camouflaged the growing fears among the fans and long standing irritants of the game. We were reduced to 16/2 in 4 overs which was not a pleasant sight. For the 0DI No 2 Team. The cheap dismissal of their main man Kohli has hurt India repeatedly, but the Triple R’s gave us some comfort. The bowling was disappointing, the pacers failed to get break-through’s as the Afghans managed to hang dourly for 20 overs at the loss of just one wicket. The Indian bowlers failed to run through a brittle Afghan batting line up. The fielding was below average with too many catches dropped by Raydu, Shami, Jadeja respectively and a miss stumping by Skipper Dhoni. In contrast Dhawan and Umesh Yadav collaborated to a spectacuar 3pt catch to remove Ghani. Although not too relevant, this win would help Dhoni’s Boys start their journey in the World cup with a positive mindset. 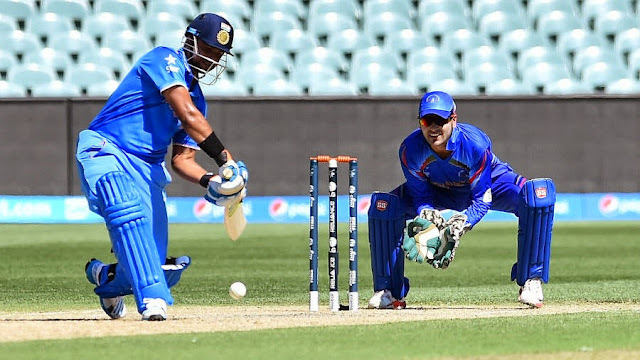 India end their two months of winless cricket as they bounce back with a big win over Afghanistan.